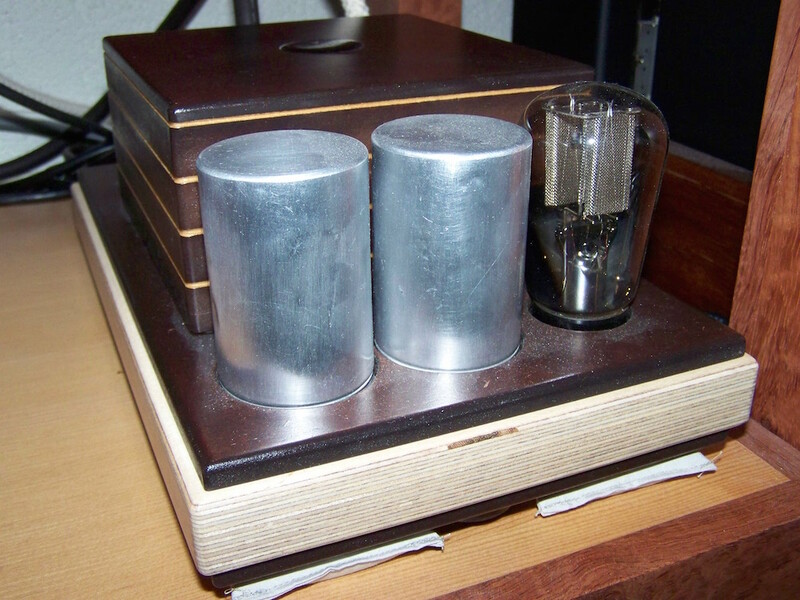 What started out as a "classic" single ended design transformed into a very good amplifier. With a classic design I mean a smaller valve for voltage amplification and a power valve driving the output transformer. In this case I started out with the EF6 in triode mode as a driver, followed by EF6 in pentode, to be substituted by the EBC3.. 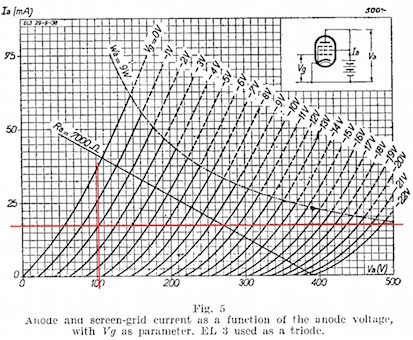 The latter because I was curious about the difference between a triode connected pentode and a genuine triode. 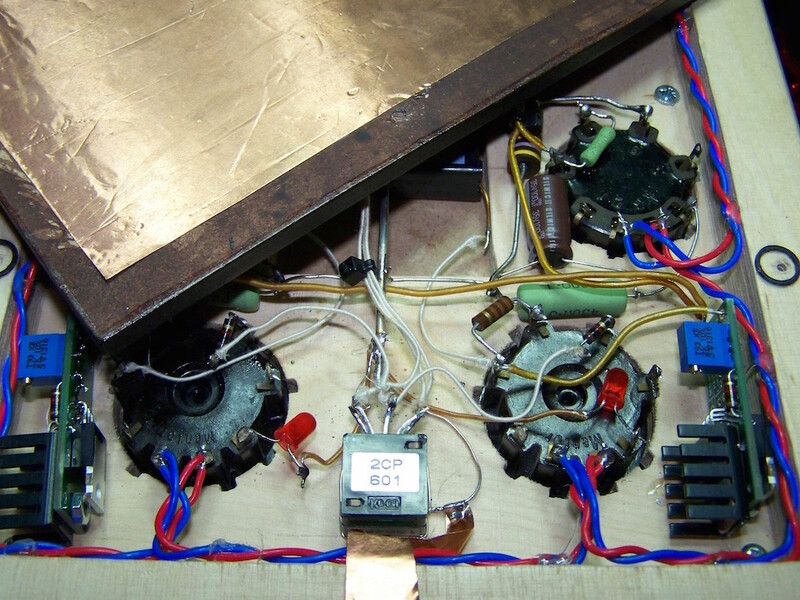 The EBC3, by the way, has also a double diode connection which was connected to the cathode of the triode. 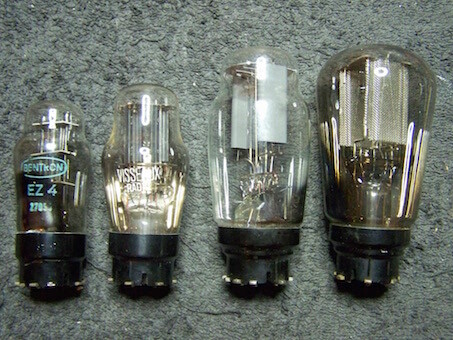 My preference was the EF6 in triode, followed by the EBC3 and EF6 in pentode. A sound description would be that the EF6 in triode sounds most easy, round and prfound whereas the EBC3 and EF6 in pentode are more analytical. All were plate-followers, resistor loaded and -biased, capacitor coupled to the power stage. Resistors were Kiwame, decoupling capacitors by Elna and coupling capacitor TCC paper-in-oil (which I happen to like a lot!). Red series by Philips. 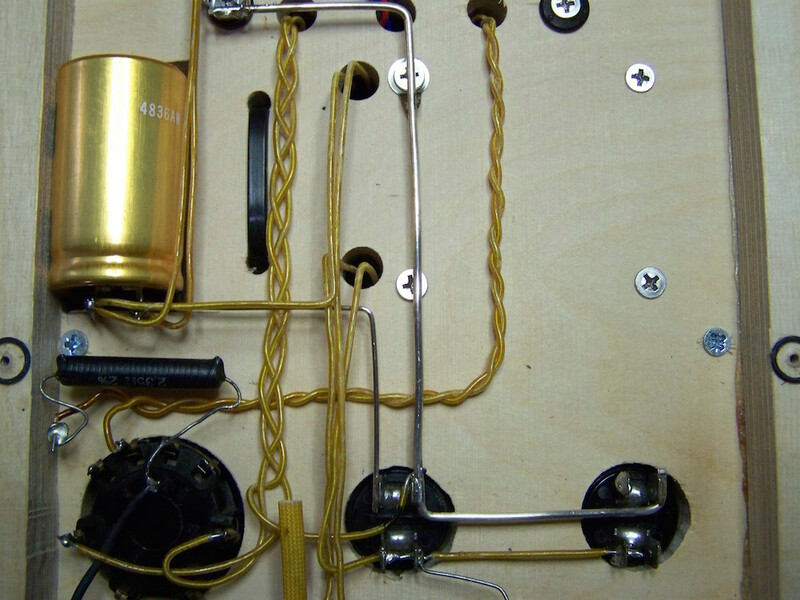 (photo taken from Radiomuseum.org). These are really special, in my opinion. Especially the early side-contact series. When operated correctly these valves have a very energetic sound which is very pleasing for almost all music varieties. Downside is the side-contact socket, not very safe and it relies on the spring effect of metal to make contact. However I do like the fact that the valve base is tucked away in the chassis and that the metal contact strips in the sockets are of modest dimensions (no thick lumps of metal). 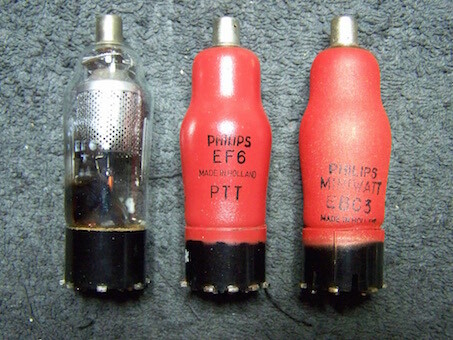 The Philips red-series are all of the highest possible quality of that time and certainly applied as a reference to other valve manufacturers both then (and now).. Dutch engineering at the top! 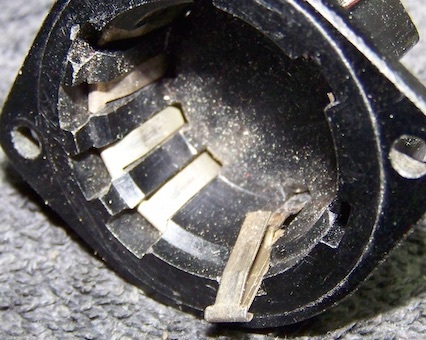 Side pin socket, or P-socket. The metal contact strips can loose their springiness. Very important as always in an amplifier. 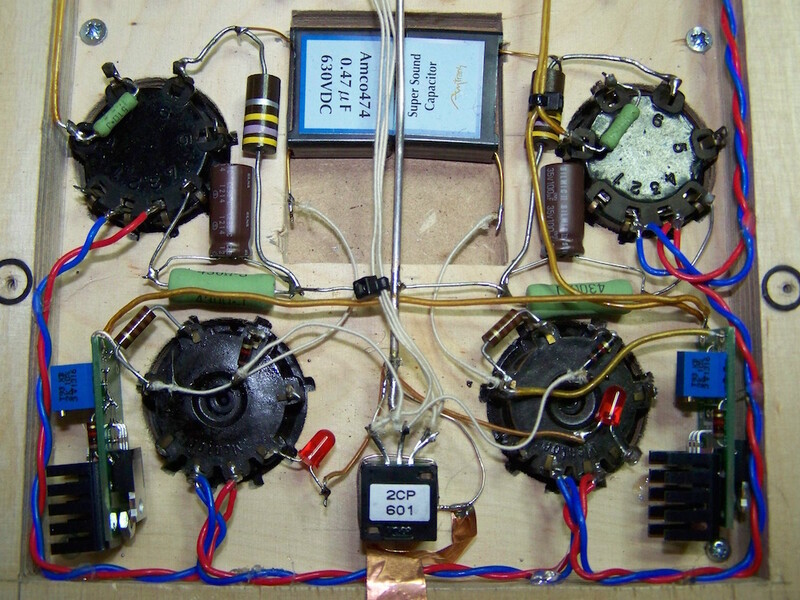 This is a choke input powersupply with low value first capacitors and a higher value electrolytic as final capacitor. Lower value are Siemens MKV and the electrolytic was Nichicon KX (good!) and in the final version AudioNote Kaisei (better!). Due to the indirectly heated EL3N´s my preference was an inderectly heated rectifier as well. I opted for an all sidepin contact amplifier, so that left me for the EZ4. That is a remarkable efficient rectifier, almost as efficient as a GZ34. However I ended up with the AZ1 because the voltage drop suited the EL3N the best. That means that at switch on the plate voltage reaches almost 400 Volts before the EL3N´s warm up but according to the datasheet that should be no problem. When using the indirectly heated EZ4, power supply voltage will not pass 300 Volts but is about 30 Volts higher when using an AZ1. Bentron and Visseaux EZ4 with globe mesh and ST AZ1. This is a real pentode, no beam tetrode. It is the 6.3 Volt heated version of the AL4 and Philips improved the design which became the EL3N. When used single ended, it can deliver 4 Watts in pentode and just over 1 Watt in triode. When used triode connected Single Ended, word is that it can compete the famous (and insanely expensive) AD1. That, of course, is a doubtful statement since the quality of an amplifier does not solely depend on power valve choice. The EL3 is efficient, it does not need a hefty driver, and is economical on heater supply. When operated at the datasheets operating points, sound is energetic and seductive. Tone is very good, and both lows and highs are in good proportion. Of course component choice allows for some tweaking, but in general you can not go wrong with the EL3N as a power valve. Different shapes and variations of the EL3N and one EL3 (photo left taken from Radiomuseum.org). Interestingly not many triodes are available from the same series.. 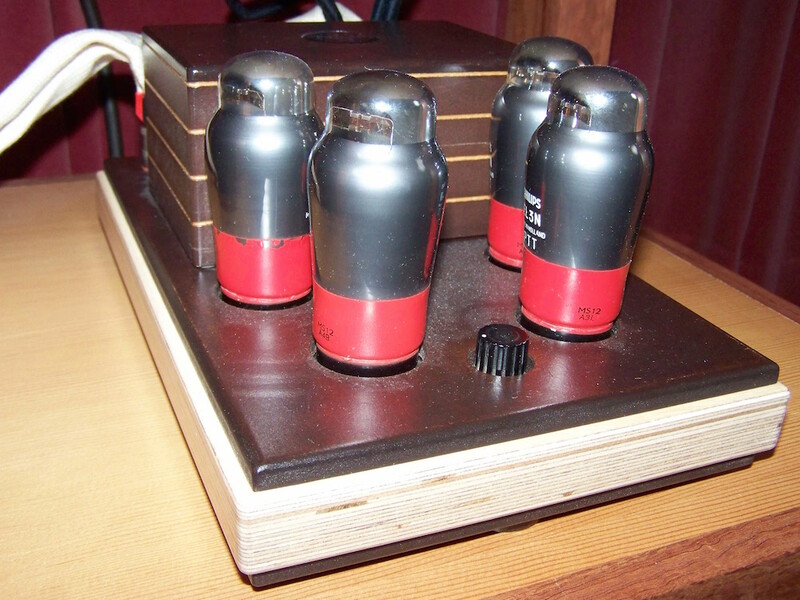 The one that is available is the EBC3, a triode and two diodes in the same glass envelope. It was designed with automatic gain control in radio circuits in mind, but the datasheet also provides operating data for triode. It requires a modest heater supply and has good cathode to heater insulation. I was able to use an AC heater supply without noticeable hum. The EF6 is the predecessor of the EF86, which is nowadays one of the famous signal pentodes. It requires the same heater supply as the EBC3 and can also be smoothly run from AC in both triode and pentode connection. In triode mode amplification is less than the EBC3, as pentode that is adjustable. Well, I already gave away my preference.. The triode connected EF6 matches the EL3N very well. EF6 with (Philips) and without (Tungsram) shielding red paint and an EBC3. What is Sakuma style? Well if you look at the Sakuma designs, you can see that he often uses power valves as drivers. Many times the driver is the same valve as the power valve. Sakuma has some interesting designs as well, like "the window of sound" and "two point earthing method" which, according to him, directy translates to good sound quality. Supposedly authority in sound is determined by the energy of the heater, be it directly or inderctly heated valves. Maybe if we look at that aspect, high energy on the heater means most certainly a power valve which has a low plate impedance. So to go Sakuma style maybe EL3N driving EL3N might improve sound quality? Two power valves means twice the plate current? This might be an issue with the old Philips power transformer I am using and since running the driver high on dissipation is not really needed, I choose a more suitable (triode connected) operating point from the data sheet. Biased at -2 Volts and running at 100 Volts means about 14mA plate current which suits my power transformer. To get the needed voltage drop from the 250 Volts supply I decided to go for a CCS. This beacuse a plate resistor would translate in a max value of 10 KiloOhms with no possible additional power supply filtering. A CCS has a fairly high power supply rejection ratio (PSRR) thus takes care of the extra power supply filtering issue. The -2 Volts bias could be realised by a cheap red led which has advantage over resistor biasing. This set-up translates in maximum gain from the triode connected EL3N and still represents a much lower plate impedance over the EBC3 and pentode connected EF6. The triode connected EF6 also has a low plate impdance, but the EL3N runs at three times the plate current, so being able to push better the lower frequencies in the the power valves´ grid. Operating point of the EL3N as driver, CCS loaded, biased at appr. -2 Volts..
And? How does that compare? Well, some things do not need long time listening and so is this combination. At first I was a little afraid that some of the signatures of the EL3N were doubled as well, but maybe the different operating points and methods of loading do prevent that. The EL3N also accepts AC heating without hum and is not microphonic as power valves can be. The EL3N driver outclasses the earlier versions in both energy and involvement. Especially the energy on each and every soundbit is addictive. Add to that the overall tonal correctness and wide plus deep soundstage and we have an amplifier in the upper class that can easily compete with low-power triode Single Ended amplifiers. It is very easy to build and components can be kept cheap to get good quality. The circuit is able to let you hear minor and big component changes, so tweaking is very challenging. And the Philips EL3N NOS go for about 15€ (at the moment), not a power triode that can compete with that! The amplifer part. Four times EL3N.. The power supply part with AZ1 and MKV capacitors..
Innards of the amplifier part with CCS and led´s, Kiwame, AllenBradley and Amtrans..
Innards of the powersupply section. Almost empty, only an AudioNote Kaisei.. Shielding the bottom. Wood is very easy to work with, absorbs mechanical vibrations very well but has zero shielding capabilities.. Most certainly the overall soundquality of a Single Ended valve amplifier depends highly on the quality of the output transformer. In this design it was custom made by Martin Mug, highly recommended! And if in need of a massive 3 Watts of extra output power, connect the EL3N output valve in pentode and change the 420 ohm cathode resistor into a 150 ohm resistor. Almost the same sound, maybe an itsy bitsy less magical..